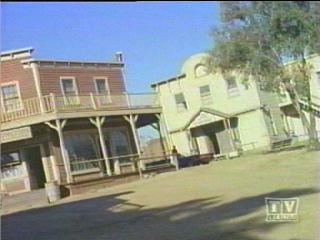 Episode #17 -- "True or False Face"
There are many Forty Acres scenes in this episode. 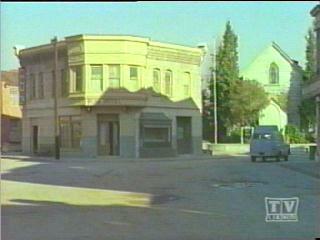 The first one is at Gotham National Bank. There is a great "upshot" of Robin with the Atlanta Examiner, from Gone With The Wind, in the background. Robin in front of the Atlanta Examiner. The Grand Theater can be seen from Robin's point of view. The Grand Theater is in the distance. 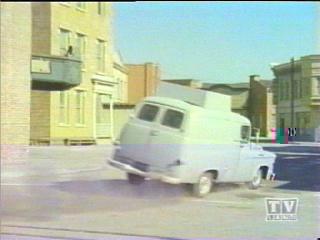 Panel truck pulls out of big box and drives east, past the Grand Theater towards Back Street. 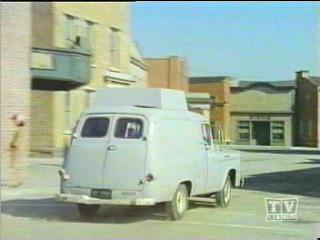 False Face drives past the Grand Theater. 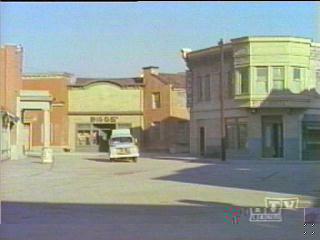 then turns left onto Main Street, past the Grand Theater again, and to right of drug store. past the Grand Theater, and toward the drug store. 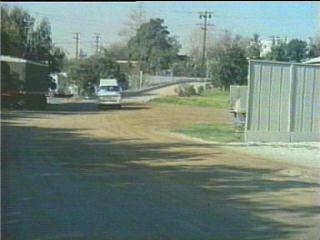 Episode #18 -- "Holy Rat Race"
entrance I used in 1975 when going to film Switchblade Sisters. 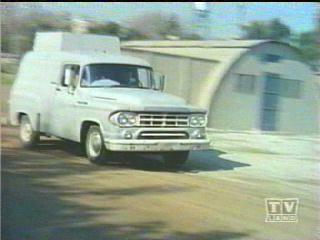 False Face then drives his pickup truck past the quonset huts of Gomer Pyle USMC. Jack Thompson indicates the exact location on the map at the bottom of this page. 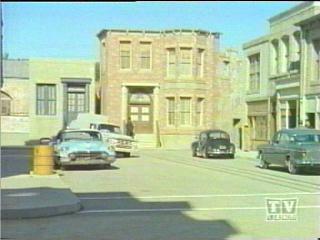 and passes right by Gomer's former digs. 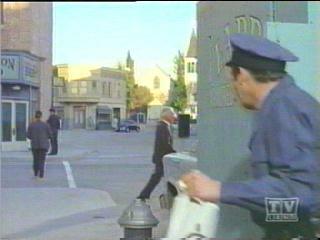 Also, notice the Desilu water tower in the distance. 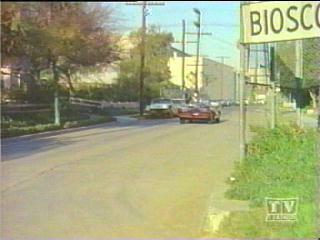 Bioscope Studios sign-- at the Ince St. entrance. 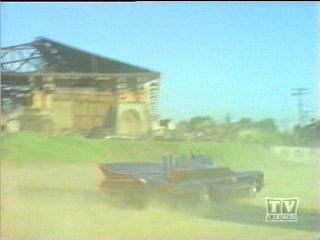 The Batmobile enters Forty Acres. 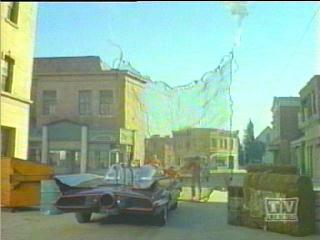 Later, the Batmobile passes the back of some facades that I believe to be part of the Garden of Allah. 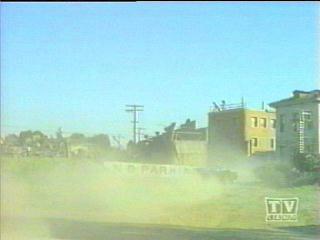 The camera pans right and we see the south end of the Atlanta train depo from Gone With The Wind. Gone With the Wind's Atlanta Train Depot. The brick building in the far distance is the Atlanta Examiner. As you can see, False False never gets too far away. Once again he passes the drug store. 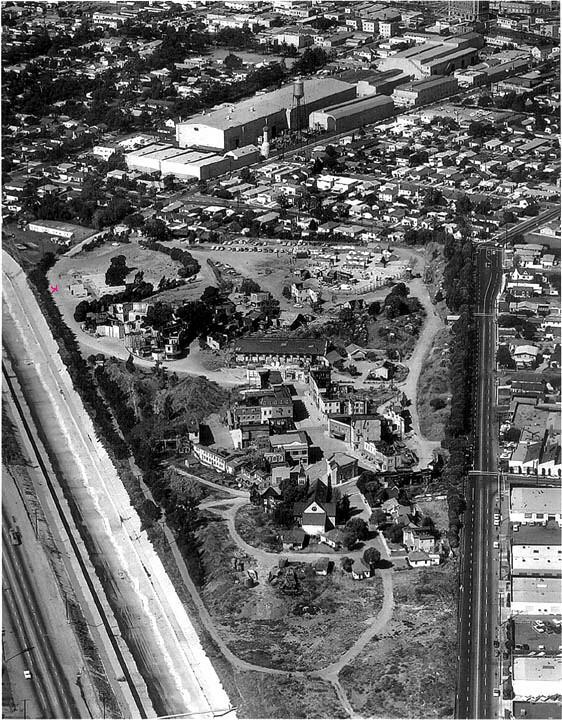 Note church on the right. 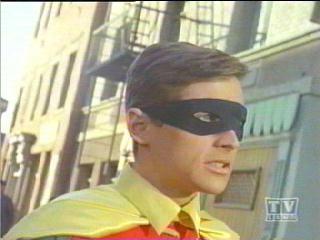 False Face emerges from behind the drug store. As the net falls, we have an excellent shot of the Grand Theater. Action continues on a Forty Acres Western Street. Then moves to the Garden of Allah facades. 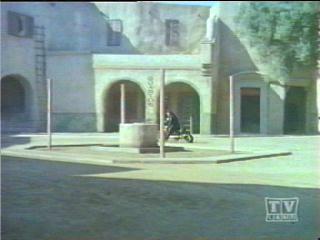 X marks the spot where False Face pases Gomer Pyle's quonset huts. This is truly a marvelous episode worth many many rewatches.